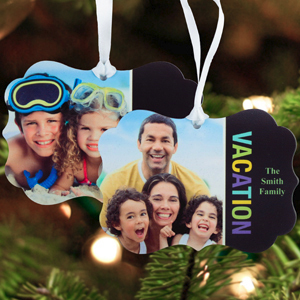 The wide shape is ideal to fit family and group photos onto the ornament. 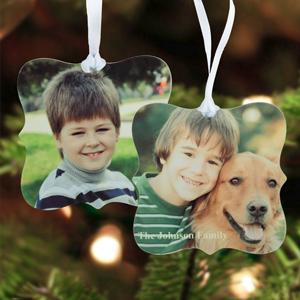 These square shaped ornaments offers a balanced and even space for your photos. Make an ornament each for everyone in the family with these fun mini pieces. Size and Shape: 3x3" Ornate, 4x3" Horizontal Ornate. Material: printed to a 1/16" lightweight die-cut specially coated aluminum. Ready to hang with a red satin ribbon included. Option to print two-sided or on front side only, back is white color. We use high-heat technology to fuse your image into specially coated aluminum for ultra vibrant colors and incredible detail for a durable memento that will bring joy for many holidays to come. 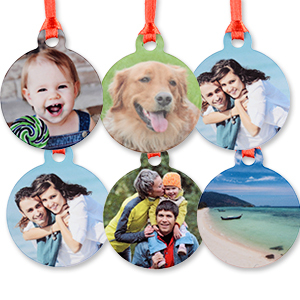 A fun and easy way to share your images and photos on metal ornament to trim the tree and will look amazing on any tree for years to come. Make one for everyone in the family and add one each year as a new family tradition. Makes an excellent personal gift for family and friends.